Curved Sea Cabin - Walk to the Beach! 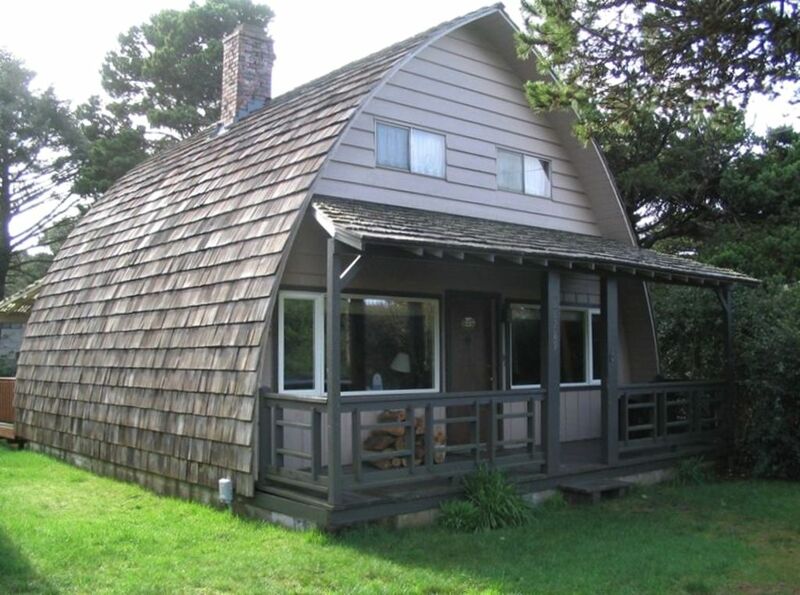 A short walk to the beach, this beautiful A-frame cabin has curved walls made of solid knotty-pine wood. Cathedral ceilings accompanied by the sound of the ocean give a wonderful feel to the two bedrooms upstairs, which are supplied with down pillows and comforters. The centerpiece of the cabin is a large, beautiful, stone fireplace. The warmth of an evening fire combined with the gently curving walls of this cabin help to bring family and friends together in a comfortable and relaxing atmosphere. A large back deck and back yard offer up the sounds of the ocean. You'll share the back yard with several species of birds, including hummingbirds, who frequent the area. The cabin is two blocks from beautiful Heceta Beach which provides miles of white sand and driftwood for long or short walks. Ten minutes north of the cabin are the Sea Lion Caves, the world's largest sea cave. Slightly further is Heceta Head, the West Coast's most photographed lighthouse. Tide pools with sea anemones and star fish abound. Just a two block walk to beautiful Heceta Beach. The best cozy, quaint place on the beach! Loved the fireplace. Went there for a birthday getaway & couldn't have asked for a more perfect setting. Very easy people to rent from. Friendly & communicative. Will definitely be staying there again. The cabin was a mix of charming details wood paneling, a great fire place and board games...but also in need of some cozy cabin updates (like bathroom, furniture and lighting). The kitchen has a hodgepodge of cooking tools, so bring your own if you love to cook. If you're looking for more aesthetic charm, you may want to keep looking, but this is a good family and pet-friendly place, with communicative and attentive owners. Our overall visit to Florence was fantastic! Great restaurants, beautiful landscapes and kid friendly attractions, like the sea-lion caves. It really is the perfect beachside town with so much to do in any season. The cabin is clean, cozy, and stocked with everything you might need. The nearby Fred Meyer means you can stock up on food for your time there and prepare it in the cabin's kitchen (pots, plates, utensils, etc. ready to go!) to save money if you don't want to eat out for every meal. The nearby town of Florence is delightful. The area is quiet and relaxing with a beautiful beach a short walk from the cabin. Great spot to walk along the shore and enjoy a sunset over the water. Highly recommend this cozy spot, we hope to return very soon! We had a nice time staying here. Wish it would have had a grill and the yard was fully fenced for the dogs but otherwise it was great! Would definitely stay again when visiting Florence. Just what we were looking for! We had a great time at the cabin. It was equipped with everything we needed and was quite charming! Having the beach a quick walk away was perfect! Based on previous reviews, our expectations were pretty high. Can say that our expectations were met. It is a beautiful cabin that provided a wonderful place to stay for our party of four. Had no issues before, during or after the visit. We hope to have the opportunity to stay there again in future visits. The owners were very helpful with getting details and instructions to us well before the visit. Loved it!!!!! The town of Florence is only 5 minutes away by car and has a variety of quaint shops and restaurants. The Oregon Dunes Recreation Area (with some of the largest dunes in the world) is only a short drive south of the cabin. With miles of beaches, prolific estuaries, mature conifer forests, & cool, fish-filled Lakes, the coast here provides terrific opportunities for hiking, & birding. If you walk north from the cabin, for quite a ways, you will eventually reach a spot where the beach stops, and the mountains rise up out of the ocean. Non-Smoking Home. Pets extra, please ask about pet policies. Full refund, less $115 administrative fee, for cancellations with 60 days notice prior to check-in date. Full refund of days re-rented by other guests, less $115 administrative fee, for cancellations with less than 60 days notice prior to check-in date.